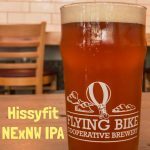 Exciting things at your favorite Beer Co-op! Hey fellow Member-Owners, and others! Now that our fantastic summer is but a receding memory in the gloom of fall, I wanted to remind you that your tireless board and committees have been hard at work on several different fronts on your behalf, and it's time to recap some of the cool stuff they've accomplished! 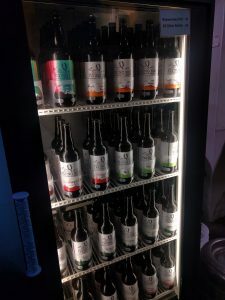 We have Bottles-to-Go in a Cooler! Now you can bring your favorite brews home to share with friends or to gift! Most beers are $5-$7 per bomber (which is damn reasonable - have you been to a grocery lately?? ), and they make terrific presents for beer lovers, or host gifts at parties! It's also a great way to "brag" about the brewery you own in a very cool way for any dinner event; you can be serving "your beer"! Check them out and be sure to thank Scott for all his hard work in keeping that cooler filled! We have Kegs-to-Go for members as well! Perfect for your Holiday parties, most beers* are available for members to take home in kegs for about $70-85 per keg (for 1/6ths and 1/4's, respectively). 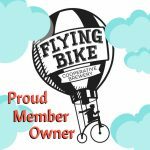 Email info@flyingbike.coop to inquire, or to place your order! And if you have your own corny to fill, with a little notice we can do that too! (Member supplied cornys must be clean, sanitized & sealed to be filled). Member only T-shirt & Pint Glass! Check it out at this link, and tell your friends they can now easily join you as an owner of a brewery! 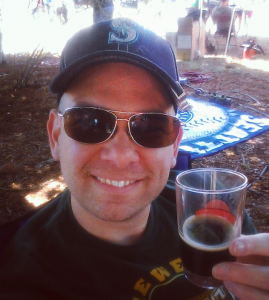 Membership also makes an awesome Holiday present for that beer snob lover in your life! Group Discounts in the Tasting Room! 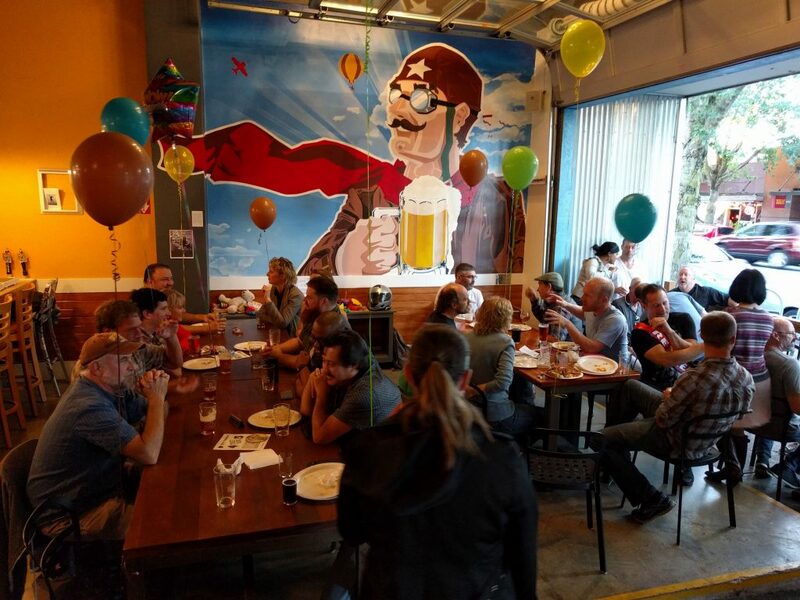 Did you know that since you're an owner, if you "host" a gathering at the brewery with over 30 people, that you can get a discount on beer for you and them? Yep! It has to consist of a group of 30 or more people to qualify. So email us today, and have your next company, activity group or birthday event at the Bike! While we mourned the loss of Munch Cafe (closed due to family-personal reasons), our "let them eat cake!" team was hard at work coming up with a replacement option. 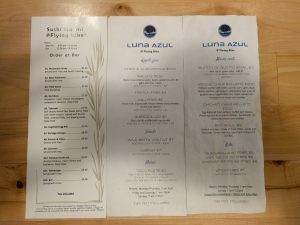 Well, not only do we have a great relationship established now with the new place next door -Sushi Naomi - to serve food to your table, but we have also fostered a relationship with Luna Azul down the street to offer some authentic Latin-American food as well - also delivered right to your table! Both establishments have received rave reviews from our regulars, and they provide fresh hot food to your table when you order at the bar! 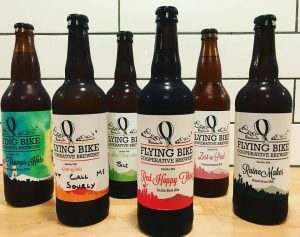 Not ones to rest on their hop bines, your board has been relentless in it's efforts to make you proud as the owner of the coolest Brewery Co-op on the Left Coast: Flying Bike. 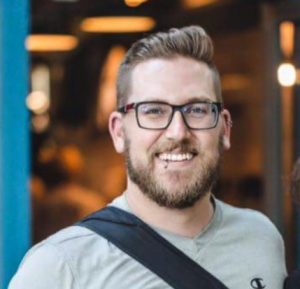 And don't forget to welcome our newest Flying Bike Directors next time you're in: Matt Knezevitch & Austin Rood!